From initial conversations on how to bring together technology, preparedness, and collaboration, SharedGeo has grown into a federally recognized Minnesota based nonprofit serving the needs of diverse communities of interest. Our emphasis throughout this development has been on building reusable open-source mapping tools that will enable users to work together and share data geographic data for the benefit of all. Faced with the need to support security efforts involving multiple cities, counties, and levels of government for the 2008 Republican National Convention in St. Paul, and with only limited access to Federal geospatial systems, members of the Emergency Preparedness Committee (EPC) of the MN Governor’s Council on Geographic Information undertook development of their own a Common Operating Picture. Built on an open source software platform called GeoMOOSE, the system was unique in its ability to display geospatial information as maintained and controlled by the original data providers. This product, produced by what would later become SharedGeo’s development team, was used by EPC members at the U.S. Secret Service Multi Agency Communication Center, State Emergency Operations Center, and several metro-area county and city Emergency Operations Centers. In addition, the developmental team also worked closely with the Minnesota Wing of the Civil Air Patrol to put in place high speed download and WMS distribution of CAP ARCHER imagery on an as needed basis. This was believed to have been a first in the nation effort. After this RNC experience, on Sept. 30, 2008, SharedGeo was established as a nonprofit corporation to support collaborative projects and advance system design/implementations which increase the exchange of geospatial information for the common good. When the Red River Valley flooded in April 2009, MnGeo’s Emergency Preparedness Committee used software, web services and hosting donated by SharedGeo, as well as services provided by other units of government, to create an online node for downloading highly accurate and current maps for disaster response workers and the general public. This product is believed to have been a first in the nation effort. The site was briefly re-activated in the spring of 2010 in preparation for anticipated renewed flooding. SharedGeo subsequently provided assistance to open-source mapping initiatives for the Haiti Earthquake Response based on techniques developed for Red River flooding (efficient handling of large volumes of image files). In 2009/2010, SharedGeo developed a prototype platform for the statewide collection, publication and long term sustainable maintenance of data related to structures such as police and fire stations, hospitals, and schools. This project was completed under a contract with the Minnesota Geographic Information Office (MnGeo), as funded by the Federal Geographic Data Committee. This was a first in the nation effort outside of commercial efforts (e.g. Boeing Corp.) sponsored by DHS. 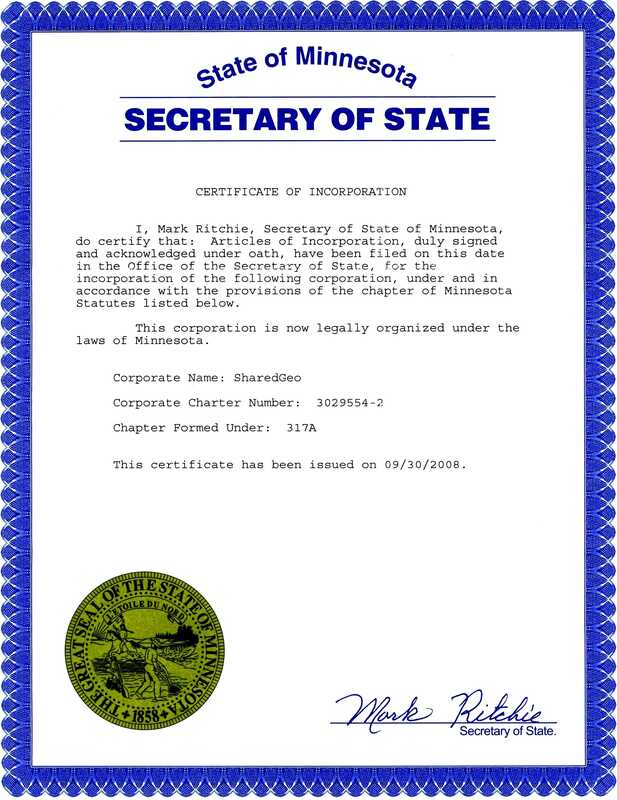 SharedGeo worked under a contract with the Twin Cities Metropolitan Council’s MetroGIS program to develop a web service lists all jurisdictions that apply to a particular point, and find the nearest government service based on a particular location. This project also involved loading and/or accessing data from many local government sources and using it in a standardized way to provide a unified service to users. SharedGeo’s project team included Houston Engineering, Inc. This open-source, online geospatial viewing system is being developed for habitat imagery/data file cataloging, access, integration and distribution in support of the Great Lakes Restoration Initiative. Companion grants for this project were awarded to the University of Minnesota –Twin Cities, St. Mary’s University of Minnesota, Michigan Tech Research Institute, and Ducks Unlimited. SharedGeo personnel are actively involved in nationally ground breaking efforts to install standardized U.S. National Grid (USNG) emergency location markers along part of a major trail system in Northern Minnesota. SharedGeo has begun a program for providing USNG-enabled GPS units to First Response personnel in Minnesota who would otherwise be unable to afford a unit. To date, funding for this project has been provided by individual donors.